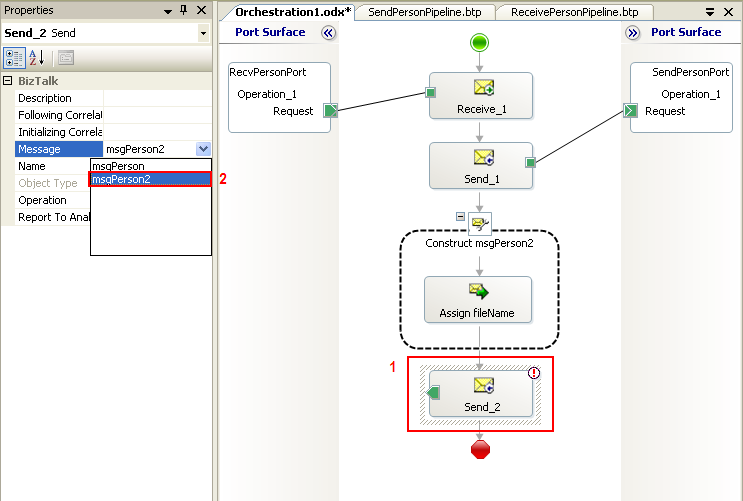 This tutorial shows how to customize output filename inside orchestration. Learn how to change filename of the output file. Add variable in the orchestration. 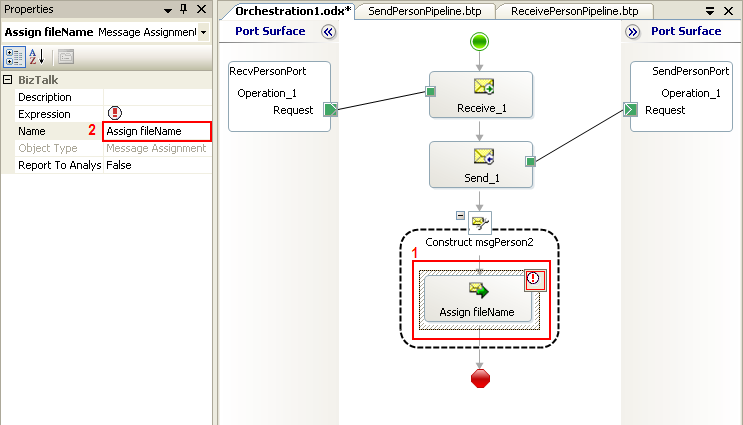 Add Message Assignment to the orchestration. Suppose that I want to change name of outgoing file. As in training 2, the input filename is *.txt format but I want the outgoing message type as xml format and also add “output_” text before. E.g. 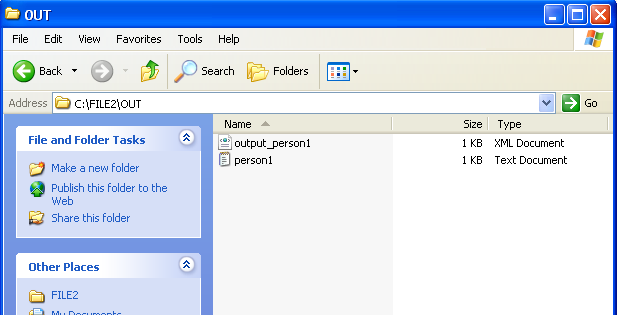 incoming filename is “person1.txt”, outgoing filename will be “output_person1.xml”. 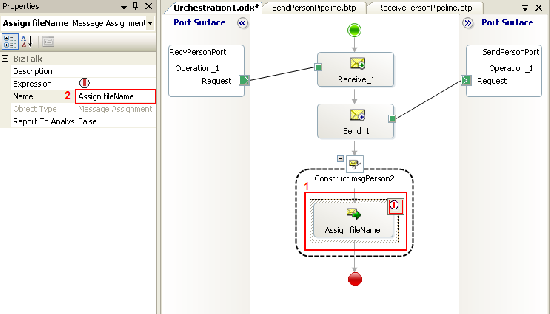 Open Orchestration1 in BizTalkTraining. 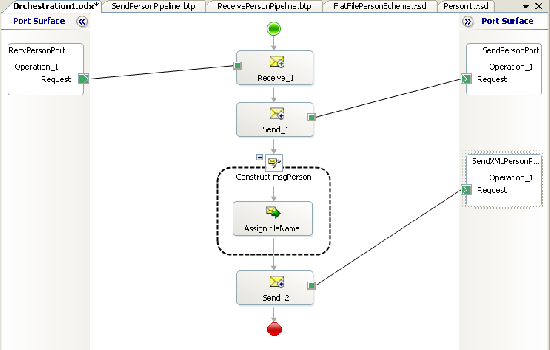 (Project from BizTalk Training 2). 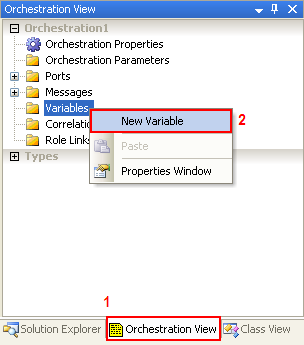 Switch to Orchestration View, right click on Variables and select New Variable. 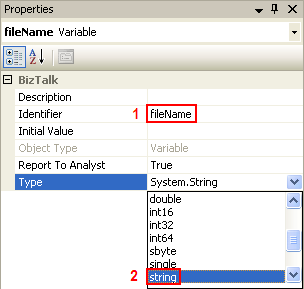 On Variable Property, change Identifier to “fileName”. Now youâ€™ve add variable name “fileName” as string to the Orchestration1. 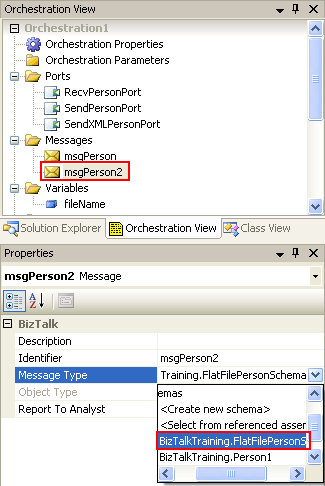 Create new Message on the orchestration name “msgPerson2” and set Message Type as the same as msgPerson (BizTalkTraining.FlatFilePersonSchema). 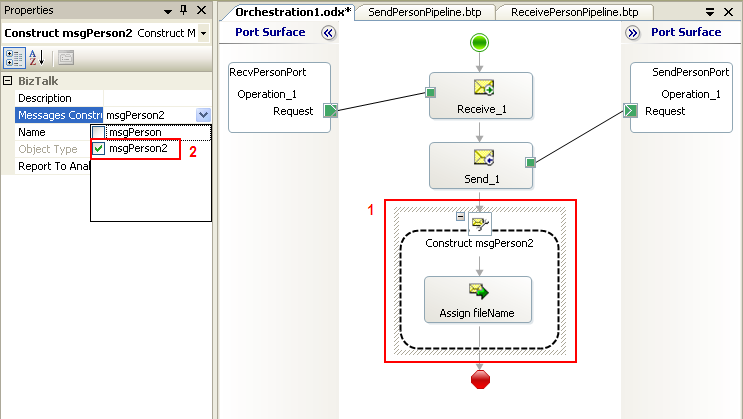 Drag Message Assignment from Toolbox to bottom of the Orchestration1. 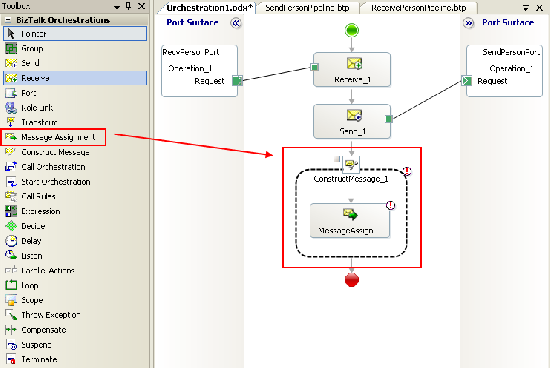 Click on ConstructMessage_1 object. 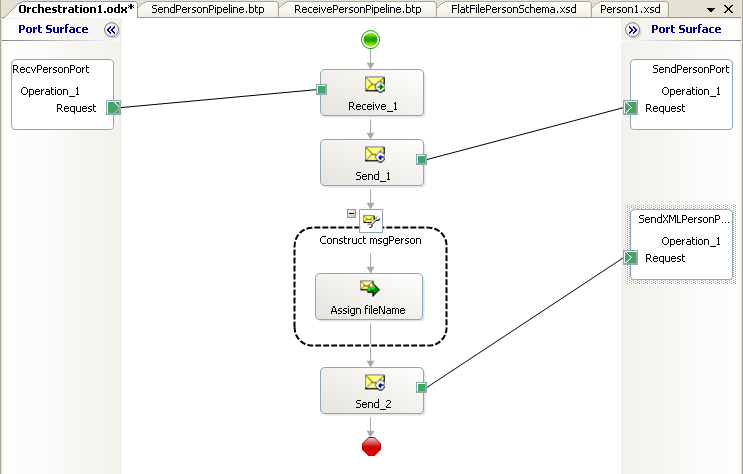 Notice that you highlights entire Construct Message object. 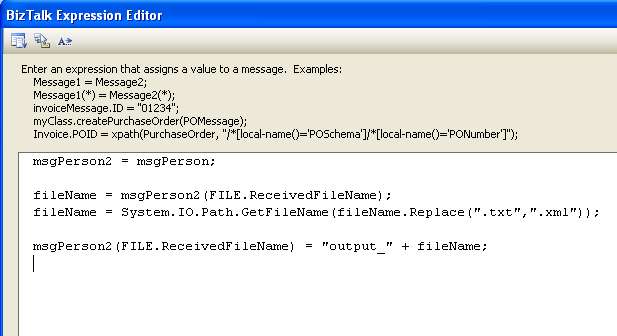 On Construct Message Properties, check msgPerson2 in Message Constructed and change Name to “Construct msgPerson2”. Click on Message Assignment (the object inside Construct Message) and change Name to “Assign fileName” in Message Assignment Properties. Double click on Message Assignment and fill in the code below and click OK. 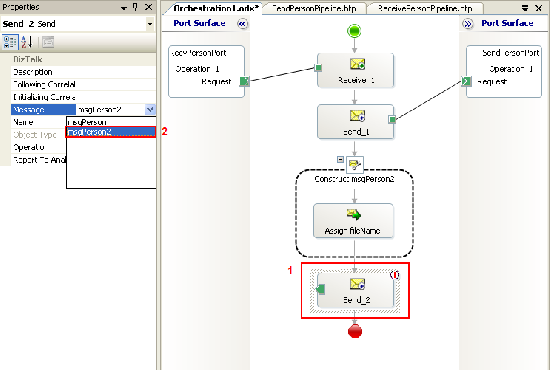 The code above assigns msgPerson to msgPerson2 and assigns incoming filename to “filename” variable, modify string and assign back to “msgPerson2”. 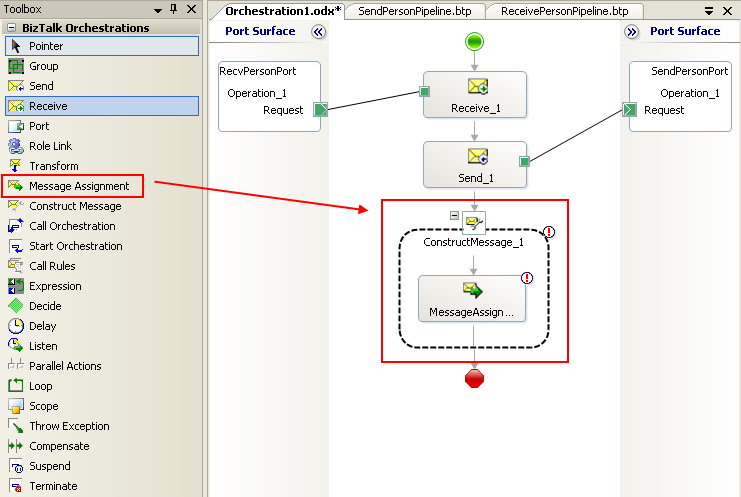 Add new send component to the bottom of the orchestration and change Message to “msgPerson”. Create new send logical port. 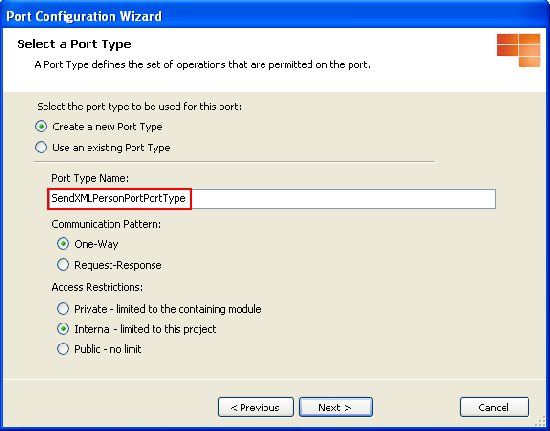 Right click on Port Surface area, select New Configured Port. Set Port Type as following configurations. 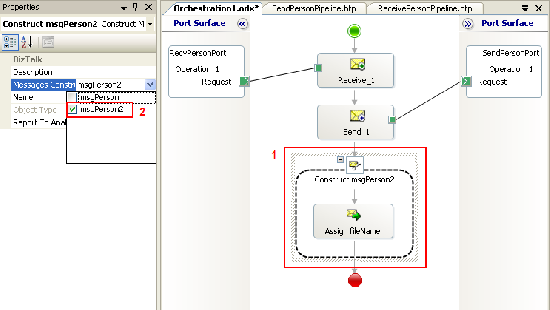 Set Port Binding as below. Port direction: Iâ€™ll always be sending messages on this port. 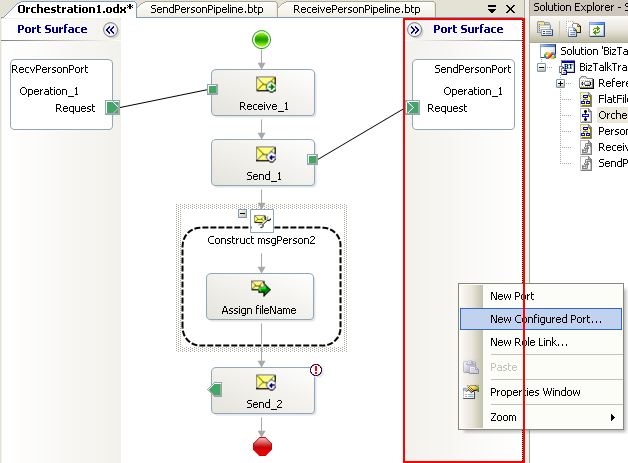 Connect green button from Send component to SendXMLPersonPort. Open BizTalk Administration and restart BizTalk host. Test application by copy person1.txt from C:\FILE2\person2.txt to C:\FILE2\IN. Note: You must any delete files in C:\FILE2\OUT before. Youâ€™ll see output in C:\FILE2\OUT. So where’s the output_person1.txt file? I just see the person1.txt and person1.xml files. It was my mistake. The output should be output_person1.xml not person1.xml. I’ll correct it soon. Very nice! It helped me and also solved my problem too. Nice Article. Thanks a lot linglom! Excellent article, exactly what I wanted. Thanks for correcting, it was my fault. I have fixed it already. I guess this method works only when we use FILE adapter as the receive port. 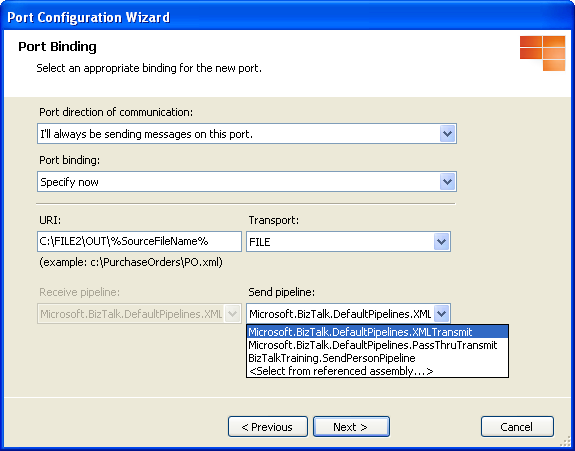 My question is how to name the file dynamically for WCF adapter receive ports? I had run the solution but I am getting only .txt file and not the .xml file. I am not getting any error message. I guess the control is not moving after Send_1. please help. I am getting below error while assigning datatype of variable .